With Getting Started with SAP Enterprise Messaging you would have got a feel of SAP Cloud Platform Enterprise Messaging. One of the features, that makes SAP Cloud Platform Enterprise Messaging completely different than any other Message Broker in the market, is its ability to enable event-driven applications. An Event can be defined as a significant change in state. Event-Driven architecture, a software architecture pattern that promotes the production, detection, consumption of and reaction to events. Monolithic applications have challenges like scalability, reliability and availability and agility. And most probably the root cause of such challenge is high cohesiveness and high coupling of its components. With Micro-services, flexibility comes with the capability of scaling only the needed components and not the application as a whole. Micro-services with Event-Driven Architecture to a great extend solves these challenges and allows building applications capable of dynamic and ever-changing capabilities because of the loosely-coupled architectures where the micro-services are designed to notify each other of changes using events. And to be able to build such an Intelligent Enterprise, SAP Cloud Platform Enterprise Messaging is supposed to play a major role by helping the event notification between micro-services or two different heterogeneous systems. 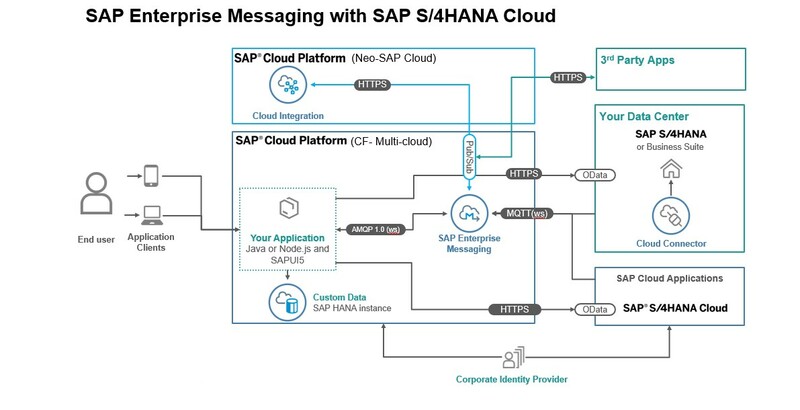 Building on this thought process, SAP Cloud Platform Enterprise Messaging has a feature of out-of-box event enablement from S/4HANA or SFSF business objects. This blog is dedicated to help the developers build an application which requires event handling from S/4HANA. To be able to consume events from an Event Source, a developer needs to follow the following steps. You already have an SAP Cloud Platform Enterprise Messaging instance configured in your CF account. Follow Getting Started with SAP Enterprise Messaging, if you are yet to. SAP Cloud Connector (if needed) and Destination configuration to access S/4HANA event catalog from CF is already completed. 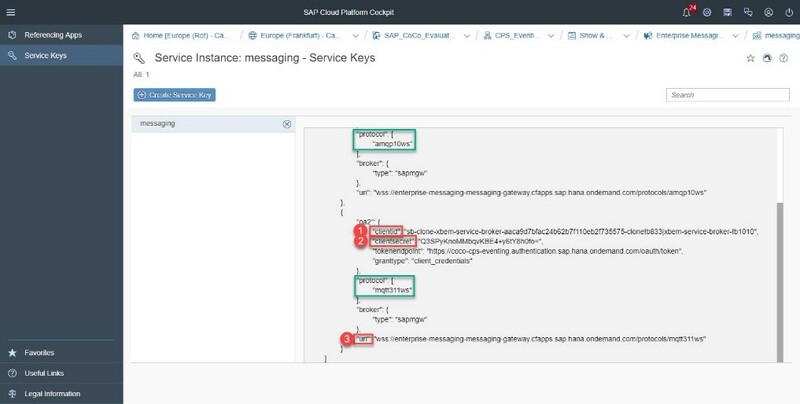 Once we have the SAP Cloud Platform Enterprise Messaging Instance available, we need to complete following configurations to enable out-of-box Eventing support from S/4HANA using SAP Cloud Platform Enterprise Messaging. Click on Create Service Key. 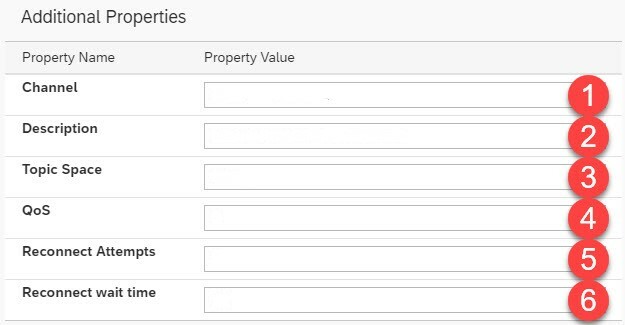 Make a note of the client ID, client secret, token endpoint and base URL, then use these parameters to create a communication arrangement. clientsecret: This is the password to be used with the clientId. Communication Arrangement on the S/4 system. Note: SAP Cloud Platform Enterprise Messaging provides several endpoints supporting different protocols (e.g. AMQP1.0 and MQTT 3.1.1 over WebSocket and REST). Navigate to Communication Management area. Select the Communication Systems tile and click on New. Provide any unique System ID and System Name and click Create. In the section User for Inbound Communication click the Add button. The Inbound Communication user is needed to access the S/4 system from the outside. If you already have an Inbound Communication User available, you can re-use the same. Otherwise create a new user by clicking on New User. The newly created Inbound Communication User is automatically selected in the dialog. Click OK to assign this user. In the section User for Outbound Communication click the Add button. The Outbound Communication User is required to connect from the S/4 system to the Enterprise Messaging on CF. The required credentials have been generated when creating the Service Key on CF. Let us set up the Communication Arrangement. Under Common Data select previously created Communication System from the value help → Inbound Communication, Inbound Services and Outbound Services get filled automatically. The Check Connection will try to check if a connection(by creating web-socket) can be established between S/4 and SAP Cloud Platform CF. In the Inbound Services section you can find the URL to call the Event Browser Service. Confirm your selection by clicking the green check mark. open the list of available Topics. 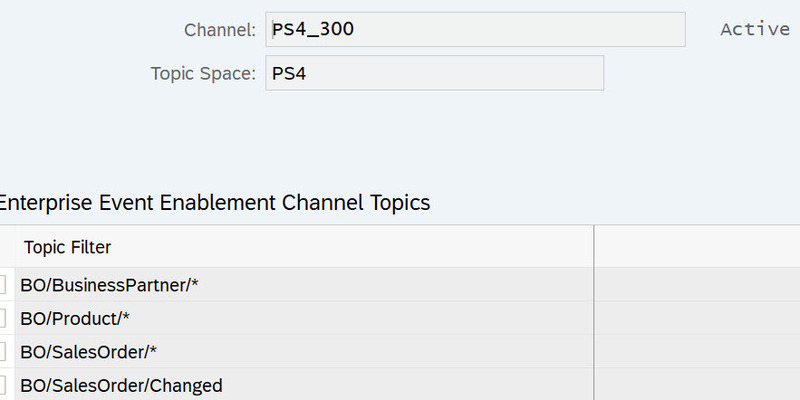 Select any of the Topics you want to add to your Channel. You can choose between specific Topics only or by selecting sub paths. Setup Queue Subscription to consume Event Topics to be exposed by this channel. Open the SAP Enterprise Message Service instance Dashboard. Select Queue Subscriptions in the Left Menu. Provide the Queue Name and the Topic Name or Pattern which you have configured in the S/4HANA system. 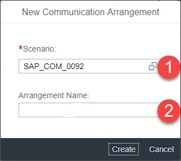 Based on the configuration done in the S/4HANA system, the queue contains the messages with the topic name and pattern. And we are done !!!!. Yes, the setup steps are done. And we are ready for the consumption. Now just subscribe your application to the queue, and you are ready to get notified (either in AMQP or in REST protocol) when a message comes to the queue. A Picture is like thousand words. And let me finish this blog, with the below picture which highlights the E2E story of out-of-box event handling support of SAP Cloud Platform Enterprise Messaging with S/4HANA. We are trying to implement enterprise messaging from S/4 On-Premise. Could you please guide us how to configure/access Communication arrangement from On-premise system? Whatever i have mentioned here is in terms of communication arrangement is for S/4HANA Cloud backend system. Request you to follow the steps given there and proceed. Should you still get stuck somewhere, do not hesitate to use this platform to let us know. Great Blog, you made my life a lot easy. Do you have the next steps on how to create an application and how to subscribe to the Queue? Thanks you liked the post. With the configuration mentioned above, messages will be published to queue against the configured event, when that event occurs. Now the application should be able to consume the message from the queue. And there are examples in git hub which helps on consuming messages from queue. In case you are using node.js, follow this messaging client sample to consume the message from the queue. And if you your program is in Java , corresponding messaging client sample is here. I did setup the OP “Enterprise Event Enablement” and was able to connect it with the event administration of the EM service. I configured the event topics OP like this for testing. As I do not have any application I just created a queue and subscribed to the topic “PS4”. Now doing any change on the BOs defined before (SO or BP for example), nothing ends up in the EM queue at all. Do you have any hint what I missed? You need to provide the pattern as PS4/* or PS4/BO/* and try. thank you for that tip. Unfortunatelly no change. I do not see any incoming messages in the queue. Have you checked if these particular business objects are active in the “Business Events Subscription”? If YES, then please try just * in queue_subscription. Need to confirm if messages are coming at all to any topic. checked, I activated all SCP related ones and changed the SCP Queue subscription to * but still nothing. Asynchronous Communication sometimes is little tricky. :). and then please activate the BUSINESS OBJECT associated with Enterprise Eventing subscriber. Below snapshot is an example in one of our systems in which Sales Order change event has not been subscribed with Enterprise Event. I assume this time you will be able to resolve the issue and can share a smile. a big 🙂 for your highly appreciated help.